The first full-length biography of the half-barbarian emperor. Maximinus was a Thracian tribesman of frightening appearance and colossal size” who could smash stones with his bare hands and pull fully laden wagons unaided. Such feats impressed the emperor Severus who enlisted Maximinus into the imperial bodyguard whereupon he embarked on a distinguished military career. Eventually he achieved senior command in the massive Roman invasion of Persia in 232 AD, and three years later he became emperor himself in a military coupthe first common soldier ever to assume the imperial throne. Supposedly more than seven feet tall (it is likely he had a pituitary disorder), Maximinus was surely one of Rome’s most extraordinary emperors. He campaigned across the Rhine and Danube for three years until a rebellion erupted in Africa and the snobbish senate engaged in civil war against him. This is a narrative account of the life and times of the Thracian giant, from his humble origins up to and beyond the civil war of 238 AD. 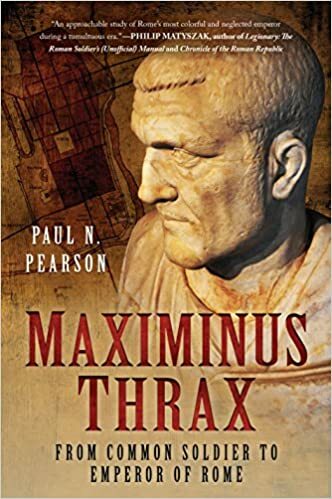 Replete with accounts of treachery, assassination, and civil war, Maximinus Thrax is written for enthusiasts of Roman history and warfare.